By mounting the HyperStar lens assembly in place of the secondary mirror, a CCD camera can be mounted at the front of the telescope allowing for a wider field of view and much faster imaging. Switching from HyperStar to the telescope's normal f/10 configuration is simple and fast. It takes only a minute or two, requires no tools, and the telescope's secondary mirror is indexed so no recollimation is necessary. 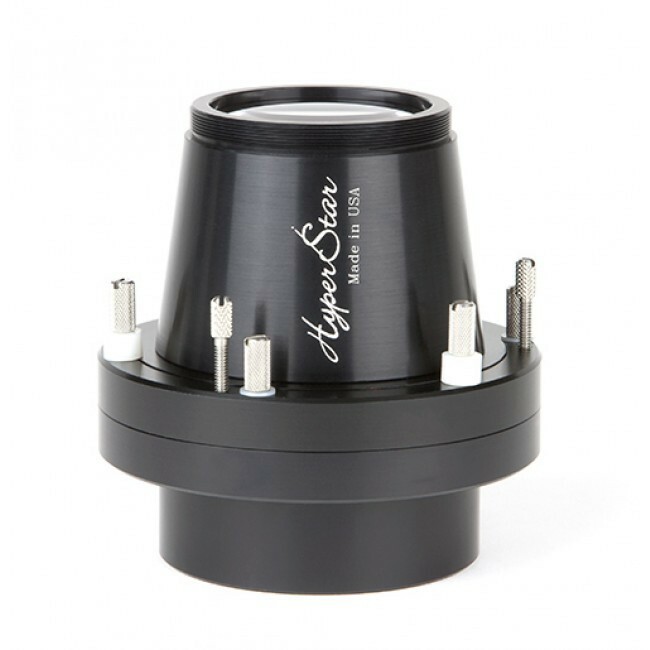 The HyperStar lens assembly works with a variety of cameras from Atik, Orion, Meade, Mallincam, SBIG, Starlight Xpress and more. Different cameras require different adapters in order to preserve the critical backfocus distance of the HyperStar lens. One adapter is included with the HyperStar lens. Please specify the camera being used when ordering. A holder is included for safe storage of the secondary mirror while imaging. Read Astronomy Technology Today's article The Evolution of Intelligent Design to better understand the history of Starizona’s HyperStar and the advantages it brings to astrophotography. The HyperStar systems allows an 11" telescope to operate at a focal ratio of f/2.0, an incredible 25 times faster than the standard f/10 focal ratio! Images can be obtained in just seconds!